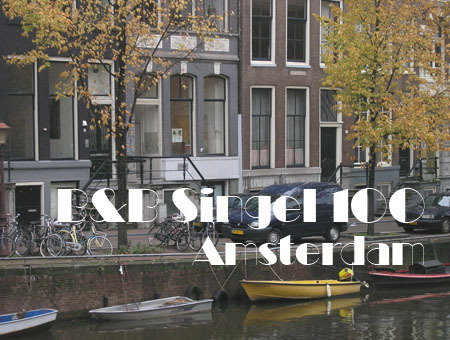 B&B Singel 100 is situated in a 17th century canal house. Singel is the canal around the old city of Amsterdam as it existed before the 17th century. A mere 7 minutes walk from the Central Station and the famous Dam Square as well as close to the Jordaan, it is the perfect location to discover and enjoy the city life, yet have a quiet room in which to relax. The entrance from the street is through the art gallery. All the comforts of an en suite bathroom (shower), TV, desk, WI-FI. 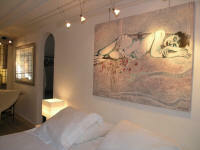 Room only (one or two persons) € 140 per night. You have free coffee and tea as well as a small fridge on the room. There is a large selection of nice places for breakfast in the immediate surroundings, but on request we can be serve you breakfast at the extra cost of € 8,- per person. Room service: Plenty towels and bedlinen are provided and we will clean the room in consultation with the guests.